Although the cornea is clear and seems to lack substance, it is actually a highly organized group of cells and proteins. 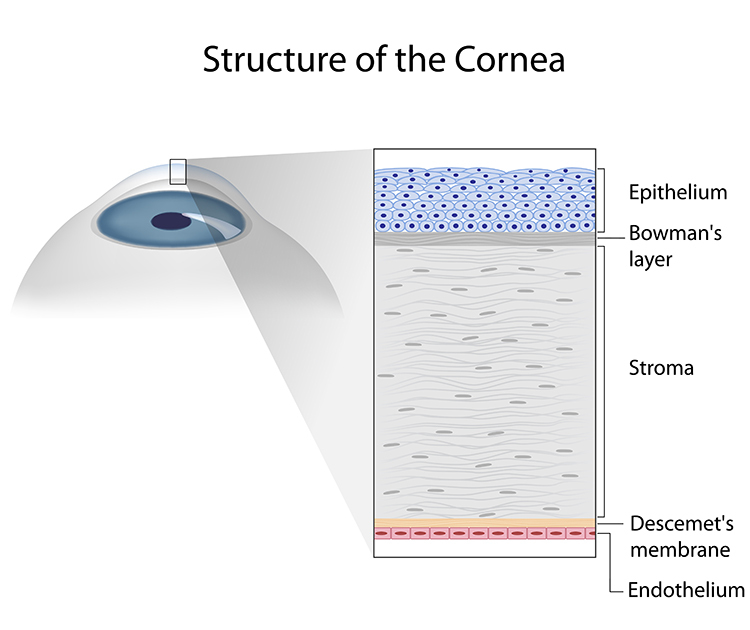 Unlike most tissues in the body, the cornea contains no blood vessels to nourish or protect it against infection. Instead, the cornea receives its nourishment from the tears and aqueous humor (a fluid in the anterior portion of the eye) that fills the chamber behind it. The cornea must remain transparent to refract light properly, and the presence of even the tiniest blood vessels can interfere with this process. To see well, all layers of the cornea must be free of any cloudy or opaque areas. When light strikes the cornea, it bends–or refracts–the incoming light onto the lens. The lens further refocuses that light onto the retina, a layer of light sensing cells lining the back of the eye that starts the translation of light into vision. For you to see clearly, light rays must be focused by the cornea and lens to fall precisely on the retina. The retina converts the light rays into impulses that are sent through the optic nerve to the brain, which interprets them as images. The refractive process is similar to the way a camera takes a picture. The cornea and lens in the eye act as the camera lens. The retina is similar to the film or digital sensor. If the image is not focused properly, the film (or retina) receives a blurry image.